Anyone who’s ever run before has had similar thoughts. Even the best, most passionate runners have nagging thoughts every once in a while. 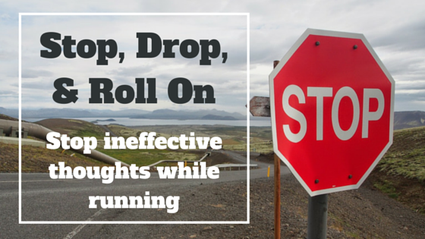 Have you considered what these thoughts do to us during a run? What about when we have these thoughts before we even lace up our sneakers? The strange thing is that running should be an easy activity! Think about it. Running is a simple concept: keep putting one foot in front of the other rather quickly. It doesn’t rely on location or require a lot of equipment. But ask a group of people if they enjoy their dose of aerobic fitness and you’ll likely hear several negative opinions. What if you could make running more enjoyable by implementing one change? You can, and it has everything to do with what goes on in the space between your ears. We call these kinds of thoughts self-talk, and the good news is that we have complete control over what we hear. Sure, ineffective thoughts are going to creep in there from time to time since after all, we have over 40,000 unique thoughts per day. But, if you practice self-awareness, you can learn to spot the thoughts that are working for you and those that are working against you. First, track what you hear. Are your thoughts filled with caution due to potential injury? Do they relate to your running environment? Do they create other peoples’ judgments of you? Knowing your enemy is the best way of defeating it. It’s important to acknowledge that the thought is occurring as ignoring it tends to make it occur more often. Second, decide on a good thought-stopping technique. Simply put, once the ineffective thought has been acknowledged, stop it. There are plenty of techniques you can use, such as the light snapping of a rubber band, creating a mental image of an X, or doing a 5-second sprint, to name a few. Lastly, you want to replace the ineffective thought with an effective one. Use your imagination to make the thought relevant to you. Do this by using one of two frameworks: instructional or motivational. An instructional thought might be, “chin up, knees up,” in order to pick your head up and drive your knees forward. A motivational thought can be as simple as “you got this” as you push to keep running. Practice a few different thoughts to see what works for you and then make it a habit with repetition. Our minds can play a large role in how well and how often we exercise. If your mind is getting in the way, simply remember these quick and easy steps: Stop, Drop, and Roll on. Just like the childhood instructions for if you happen to be on fire, when you have an ineffective thought, stop it, drop it, and insert a new, effective thought that gets you rolling forward. John Keenan is a running and mental skills coach located in Atlanta, GA. He specializes in mentally preparing runners to perform at their best when it matters most. To work with John on your mental game, visit intrepidperformance.com/contact.